Last week I wrote about five ways to start recognizing your intuition while it’s happening so that you can better know when it’s talking to you in the future. Being able to recognize the feelings associated with intuition is first step in working toward discernment and development of those abilities which we all possess. Today I’m going to give you a few tips for helping those abilities to flourish! Meditation is an excellent way to begin tapping into your intuition. Aside from all of the excellent health benefits of meditation, it also helps to focus your attention and train of thought, which plays a key part in creating intention. If you’re using meditation to strengthen intuitive abilities, I recommend starting with guided visualization meditations. There are many of them available on youtube that you can follow. These meditations will help you learn to focus and use visualization to strengthen your clairvoyancy in addition to other clairs. Dreams are one of the most common forms of intuitive communication and you might be surprised about what yours are saying! Pay attention to your dreams and start writing them down on a regular basis. Also, the more you journal your dreams, the more likely you will be to remember them and the more information you can obtain from them. I often receive guidance in the dream state and especially when I’m half awake, half asleep. 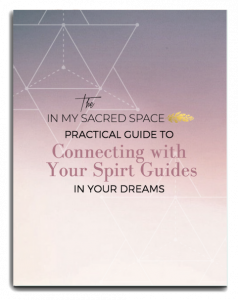 You can sign up for my online dream interpretation course, Destination Dreamspace, and learn how to deepen your intuition through dreaming. One of the first things my psychic development teacher told us was, “Don’t be afraid to be wrong.” Easier said than done! But it’s true. You can’t be afraid to acknowledge or say something that you are getting just because you are afraid you will be wrong, it will stunt your psychic development and you’ll be left constantly questioning yourself. I will say, questioning yourself is going to happen anyway – it’s just a natural part of the process, and can be healthy as well when you are trying to discern between your intellect and your intuition (see this post on psychic information bias, filters and belief systems). So how can you go about healthy discernment but still not be afraid to say what you’re receiving? My best advice to conquer fear of being wrong – and something that helped me tremendously along the way in my own intuitive development – is practicing non-attachment to the information that I was getting. Where fear creeps in the most is when we become attached to the outcome of what we receive – we’re attached to being right. We want to be right. We think being “right” is somehow a reflection of who we are and what kind of psychic we will be. We want to be accurate. It doesn’t feel good to be wrong, because being wrong means that WE are wrong…or does it? Being right or being wrong about what you think you’re getting, intuitively, is NOT a reflection of who you are – unless you allow it to be. When we’re attached to the information, we feel the need to defend it. When we’re not attached to the information we’re receiving, then it’s just that – information. Think of yourself as a conduit. A messenger. A tool. You are simply passing along a message through the grapevine. You don’t have to look at this piece of intuitive information as correct or incorrect. You can simply hold it there, objectively, as a possibility. You can hold it as a possibility for as long as necessary, until you receive other pieces of information that support it. Just file it away under, “Interesting Observations” and forget about it until something related comes along. Actually, the best thing is to not have any expectation at all about HOW you receive your communication at all. So many times people expect intuitive messages to come in a certain way, and they completely miss the real thing because they were looking for something else. When I first started trying to communicate with my guardian angel, I kept trying to see her clairvoyantly, since that was my strongest ability. I was at the dentists office and while he was cleaning my teeth, I had my eyes closed and was talking to her, and I kept asking her to show herself to me but I got nothing. In the car on my way home, I just happened to glance up at the sky. I couldn’t tell you the last time I actually took time to look at clouds, but when I did, there was a huge cloud in the shape of an angel holding the sun. That was my validation. It didn’t come the way I expected it to, and had I not been open to receiving messages in other ways, I very well could have missed it. Do you have any other tips for developing intuitive abilities? Let me know in the comments below! Are you interested in developing your intuitive abilities? Join my friend Teresa’s Facebook group for the metaphysically minded, Mission Intuition, and meet and mingle with other developing intuitives from around the globe. Got questions? Ask away! It’s a safe place (and a closed group, so your woo woo is safe in the closet, if that’s where you want it) to get insights and answers to your biggest psychic development questions. JOIN NOW.